Most kids love digging in the dirt and are excited to see the seeds they have planted growing. Gardening provides an opportunity to learn about horticulture, and tending a garden ensures that kids get fresh air and exercise. Also, connecting with the natural world can reduce stress and enhance psychological health, and children are far more amenable to eating vegetables they’ve grown themselves. 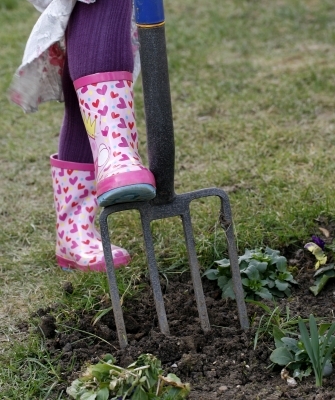 Overall, gardening is a great way to spend quality time with the kids. To ensure that gardening will be a positive experience, choose seeds that are easy to plant and grow, let kids take responsibility for their own gardens, and make gardening fun. Children may also enjoy growing plants that attract butterflies, such as lavender, or some catnip as a treat for the family pet (planting in a separate pot is recommended, as catnip can quickly take over a garden). When gardening with very young children, plants with big seeds such as peas, pumpkins, and sunflowers are best because they don’t require the same level of manual dexterity. If gardening with toddlers who are inclined to taste everything they can get their hands on, keep in mind that certain fruits or vegetables can cause unpleasant reactions if eaten before they are ripe. For example, under-ripe tomatoes can cause stomach upsets, and under-ripe potatoes and potato foliage are toxic. There are also flowers that should not be ingested, so young children should be supervised in the garden at all times. Children can gain a sense of accomplishment through caring for a garden plot (or plants in containers or window boxes if no yard space is available). Although parents or teachers with school gardens should be prepared to take on some of the gardening work, kids should have the opportunity to sow the seeds, water the garden, pick the fruits or vegetables, and engage in maintenance activities such as weeding. Ideally, there should be a small budget set aside for garden tools and decorations for each child, so that they can add little trellises, small ornaments, or other items to personalize and take ownership of their gardens. Picking out their own garden tools, seeds, and decorations will encourage them to appreciate gardening as a special activity. In addition to the enjoyment of helping something grow, there are a number of garden-related arts and crafts that can enhance the experience. For example, children can decorate customized plant markers, paint flowerpots, and make hummingbird and butterfly feeders. Chemical pesticides can create a health hazard, particularly when gardening with small children who have a tendency to touch things and then put their hands into their mouths. Luckily, there are plenty of effective natural pest control methods. For example, ladybugs are voracious consumers of aphids. Bags of ladybugs can be purchased from many garden centers, and children will enjoy releasing them and watching their exploration of the garden. If there is enough food available, the ladybugs will establish a colony, providing children with an opportunity to observe their life cycle and offering continuous aphid control services. For more safe, non-toxic plant protection solutions, see Natural Garden Pest Control. For a full list of gardening articles, visit the main Gardening page. Hole, L. (1993). Northern Vegetable Gardening: A Guide for Cooler Climates. Vancouver, BC: Lone Pine Publishing. Kiddie Gardens. (2008). “Kids Gardening and Gardens for Kids.” KiddieGardens.com.